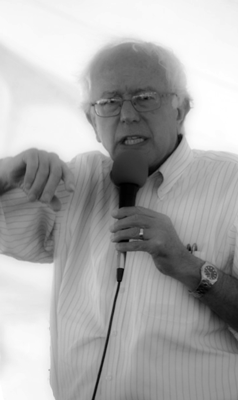 Editor’s Note: Senator Bernie Sanders will speak at the New Populism Conference on May 22. We share this piece by historian Michael Kazin, author of a great book, The Populist Persuasion. We will wave conference registration fee for people who want to attend starting after 2 pm, to hear Sen Sanders (at 4) and Rev William Barber (at 4:30) who will close the conference. Bernie Sanders may actually run for president. The feisty Senator from Vermont is giving dinner speeches in Iowa, telling journalists he’s “prepared” to campaign, and is deciding whether he wants to compete for the Democratic nomination or take the “radical” step of heading an independent ticket. Assuming he rejects the Naderish option, which would upset many of his admirers who recall the 2000 debacle, a Sanders run could be excellent news for Democrats—in the next presidential race and beyond. At a minimum, it would make the Democratic primary about more than the deeds and personality of Hillary the inevitable. Sanders, as eloquent a voice of left-wing populism as exists in the land, would press Clinton to support doubling the current minimum wage, imposing higher taxes on the wealthy, and increasing entitlement payments instead of reducing them in a “grand bargain” with Republicans. He would also push her to explain how she would end the dominion of big money in politics, long one of his signature issues. Sanders has introduced a constitutional amendment that would overturn the Supreme Court’s decision in the Citizens United case. According to multiple polls, these are all popular positions—among independents as well as Democrats. But without a shove from the left, Clinton is likely to stick to a mushy moderation, hoping a lengthy battle inside the GOP will result in a nominee too right-wing for the majority of the electorate to stomach. A Sanders campaign could also excite and mobilize some of the young people who have grown disenchanted with Obama’s achievements, yet still hold strongly progressive views. Many who supported the president in 2012 in order to defeat Mitt Romney are now cynical and disengaged. Since Occupy faded away, progressive activists have lacked a big, unified cause to fight for; they would probably flock to the white-haired senator who has been known to call himself a democratic socialist. So might other millennials, and their younger siblings who, after Obama was elected in 2008, mistook him for a movement leader rather than a new president who faced the dual challenges of a deep recession and an opposition party determined for him to fail. Read the entire post at The New Republic. Michael Kazin is a contributing editor of The New Republic and an editor of Dissent. His most recent book is American Dreamers: How the Left Changed a Nation.